HRBSE-101 | Size: 200 ml / 6.8 fl. oz. Leaves skin clean, contditioned and smooth. 99% natural origin ingredients, chemical-free formula. This deep-acting daiy cleansing lotion melts away makeup and impurities without stipping the skin's natural protective barrier. 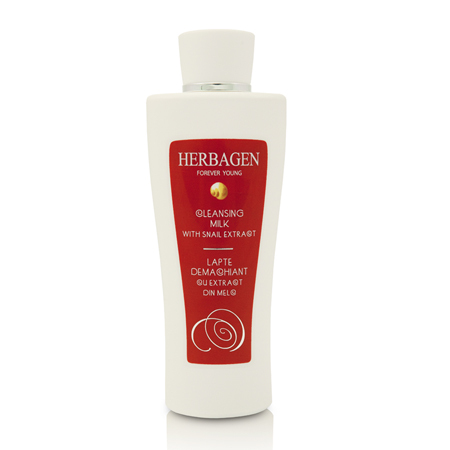 Natural extracts add extra hydration, calm skin and increase elasticity. Apply with a cotton pad on face, neck and decolletage massaging gently to remove make-up and impurities. Poly-Helixan: a powerful active, natural and ecologic ingredient, obtained from the garden snail secretion. Perfect for normal to oily and acne affected complexions. An ideal moisturizer for normal and mixed skin. Clean fairly well. Skin is soft after use.